We can’t deny that it was something of a thrill for us to catch up with the man behind what is surely Chester’s most talked about Twitter account. The S@&% Chester account (we’ll leave you to fill in the blanks but, be warned, it does have a swear word in the title) has some 21,000 followers since it was set up in 2013 by friends Tony Chester and Jennie Povey. It began as something of a joke but has evolved to be one of THE online places to go to check out the comings and goings of life in this city. And there’s a blog to accompany the Twitter account. Indeed, it’s often the first account people tag when they are talking about anything happening in and around the city, from traffic problems and carelessly dropped litter to life stories of Cestrians and tips for things to do in Chester. If you haven’t heard of it then you should definitely check it out. It makes for an interesting and, at times, controversial read, shining a spotlight on the sometimes polar opposite opinions expressed by those who live and work in the city. So when we approached the man who runs the account, aka Tony Chester, we were well chuffed to be granted an interview. I met up with Tony in one of Chester’s finest independent coffee shops, the Baristas (many other fine coffee shops are available). 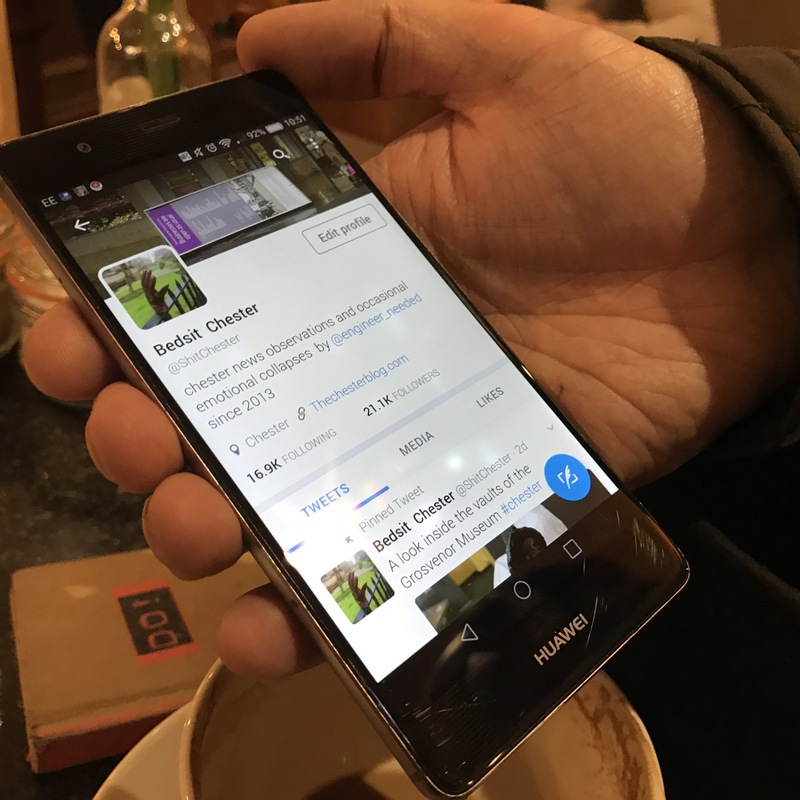 Over a flat white and a cappuccino, I chatted about all things Chester and what it is like to run such a hugely popular account. I spent an hour with Tony and, to be honest, I haven’t got enough space here to do justice to what we covered, and to Tony’s fascinating take on life in the city. He describes himself as a self-confessed insider who still somehow feels like an outsider at times. I could easily serialise our interview, but for your sanity’s sake I will try to condense it into one blog post. Tony, who set the account up with his friend Jennie Povey back in 2014, is a modest guy and likes to let the account speak for itself rather than shouting about what he does, hence the pseudonym. When I ask him if he would consider casting the veil of anonymity aside, he responds that he does not see any benefit to this. He seems perfectly happy to wander the historic streets of Chester largely anonymously, apart from when he meets those he has interviewed previously. Some know him well and will – like this starstruck blogger – share a knowing nod and a cheery hello when we spot him in the street – or in yet another of the city’s finest coffee houses. When we meet for a beverage, Tony is keen to shine a spotlight on what he feels are the many reasons that people living and working in the city have to be proud of their city. He feels that there is a tendency to grumble from time to time about what is occurring in our city and he thinks we should be more appreciative of just what we have on our doorsteps. Tony says he gets fed up of grumbles about developments in the city and of claims that some things were better in years gone by. His stance is that you have to have some development and different building styles in a city, to avoid it stagnating. He maintains that we will always have the historic core of the city, including the walls, the rows, the parks and the Groves – which can’t be touched by development. And Tony praises those who celebrate all things good in Chester, including the recent launch of independent magazine, Tortoise by Chester-based creatives Sam Ryley, Kirsty Dalton and Paul Caputo. The magazine aims to highlight people and happenings in the city, including the impending opening of the Storyhouse cultural centre. More of that later. In addition to covering day to day life in Chester, Tony also does some sterling work in raising money for charities such as The Samaritans through his popular Lego Chester display, housed in Chester Market. To date he has raised around £1000 for them, saying that he is full of admiration for people that do this work. He says he is also proud to do his bit to raise the footfall in the market, which he feels is not promoted widely enough. For someone who admits that he didn’t have the confidence to pursue his dream of being a journalist when he was younger, he has come a long way. And he beams with pride as he tells me that one of the highlights of his blogging career to date was when he was invited to a press conference in the city during the General Election, along with other members of the media. “I took four days holiday to cover the election and it was a real highlight for me. It was nice to be accepted as part of the media. I stayed up for 24 hours and the atmosphere was electric,” he says. As the conversation moves on amidst the hubbub and familiar sounds and aromas of The Baristas, we cover a huge range of topics which we both feel passionate about, including the opening of the Storyhouse cultural centre in May. He says this is what he is most looking forward to this summer. Championing existing culture, however, Tony is at pains to point out that we already have a thriving theatre scene in the city, with a number of organisations such as Tip Top Productions and the Chester Little Theatre staging popular and well received productions. Other topics we cover include plans for the Northgate development, developments in and around the city centre such as the bus station, Tony’s occasional radio shows on Flipside Radio and his stint covering elections. He is certainly one fascinating guy with a clear passion for and love of his home city. He’s the kind of person you could spend hours in the company of. He knows his stuff and his near encyclopaedic knowledge of and enthusiasm for the city is clear. When he isn’t working full time, tweeting and blogging and doing shows on Flipside Radio, he does occasionally take time away from the city. Later this year, he has a short break planned, but admits that even then he will still be logging in to his accounts. He has, in the past, covered a range of sometimes controversial issues, and talks of having experienced harassment for this on occasion. It just doesn’t seem right that someone doing their best to shine a light on the comings and goings of Chester, with the aim of making the city a better place, should have to put up with such negativity. He is at pains to stress, though, that the majority of responses he gets on social media are friendly. Despite the occasional negative comment, Tony is adamant that he will keep standing up for causes that matter. Does Tony feel overwhelmed due to the sheer number of interactions his account gets on social media? “Everything going on in the city is shared with me. It can be overwhelming at times, but it’s a privileged position to be in. “I still kind of view myself as an outsider, even though in many ways I’m an insider. It can be a very lonely and dark existence – all these events are going on and you can be standing there and can be lost in the crowd. “Three years ago no one cared what I did. Now people do care. It’s a good feeling, but at the same time it’s an empty feeling. If someone follows you, it doesn’t mean they are your friend, although it doesn’t mean they aren’t and I have made some good friends through the account. You can tweet a pic and it’s there and then it’s sort of gone. A lot of the time I feel quite existential doing this. I wonder where it’s all leading to. Tony is modest, posing the question that if the account didn’t exist then would people miss it. I offer my two penneth in that I actually think they would. I think he’s part of the fabric of Cestrian life. “I cover things that some of the other media won’t go into, particularly in terms of interviews with people about their lives. I did an interview with Chester resident Russ Hughes about his memories of Brook Street. You wouldn’t get that in the mainstream media. “When I look back over the past four years there are some bits I’m proud of. I ask Tony if he ever switches off, given that he appears to be out and about tweeting and blogging nearly every waking hour some days. Tony has interviewed numerous people during his time at the helm of S Chester and tells me it is hard to pick out one favourite person, although one of his most treasured memories is his encounter with broadcasting legend Sir Terry Wogan. Sir Terry had come to Chester to film a TV series. He is also proud to have interviewed Paddy Ashdown, also known as Lord Ashdown, during the referendum and he has also met John Prescott and Boris Johnson. I ask if Tony has any other particular proud moments relating to the account. On this note, I take my leave, accompanying Tony to watch Chester’s Rock Choir belt out a few songs at The Cross to raise money for Marie Curie Cancer Care. It’s good to see him enjoying Chester life and doing his stuff, disappearing into the crowd while recording little videos to share on social media. He’s a sound guy – and one I’m so pleased to count as a friendly fellow blogger in Chester. I feel honoured and inspired by our meeting and go on my way with a spring in my step, that little bit more proud to live in this wonderful city. On behalf of those of us living and working in this city, thank you Tony – and as long as you are happy continuing to document Chester life and to highlight the things that sometimes do need improving, then we’re lucky to have you fighting our corner. Thank you for sending me this write up. Glad you came to watch Chester Rock Choir at The Cross. Enjoyed ourselves as we always do singing in our home City!